You called in sick for work today. You informed your boss that you think your coming down with a flu and could not make it to work today. Unfortunately, one of your idiot friends uploaded your pictures while you were enjoying an out of town trip, tagged you into it and captioned, “a fun escape from work!” What’s worse, your boss is on your Facebook friends list. You told your mom that you would have a group study tonight. But you were just too excited not to check-in to this awesome new club to make your Facebook friends jealous. The night was perfect until you got home. It turned out your mom was one of your avid followers. It is a shame that millions of people are actively using Facebook but up until now, a large percentage of this population is still committing a lot of mistakes and blunders that would amount to grounding or worse, termination. On the contrary, unlike the real world, you are the one who is in control of your Facebook account. You could always choose who to add, what to post and what to share. 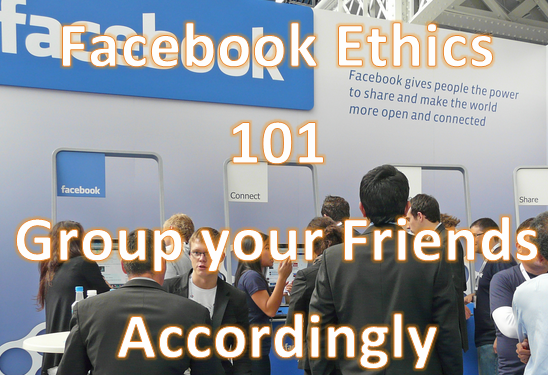 Exercise that power to avoid mishaps and possible heated arguments over your Facebook posts. One of the easiest way to guard what we post is by clearly understanding how could we filter the people who view it. When we update our status or upload pictures, there are options on the lower right corner before we post to change the settings of our audience. Here are some tips to effectively organize your friends’ list and an overview of the things you should and should not share. Who to add: As the word implies, acquaintances are people whom you just know. They could barely count as your ‘real friends’. These are the people whom you know little about and know so little about you. This list would include your new workmates, neighbors, schoolmates, distant relatives, your parents’ friends and your friends’ friends. It is also helpful to put your bosses and supervisors in this list so you could always filter and avoid exposing your little white lies. What to post: Well thought of or inspiring quotes, special trips, warm and positive posts that could be addressed to everyone. It is not called being a plastic or hypocrite if you maintain a clean image for those people who you barely knew. Your Facebook account is a reflection of you so it might also give potential close friends or intimate relationships a first impression of who you are. What not to post: Social or Religious criticisms, posts directed to one person, more than the average selfies, and check-ins. You really have no idea what might offend an acquaintance so do your best to limit criticisms about other personalities, groups or religions. Those kinds of post might gain you some enemies. By flooding your wall with your selfies and a list of places where you are and have been, you are basically inviting a stalker. Who to add: Your closest friends! People who you knew for years and who know you and love you all to well to accept everything that you would post in your wall! What to post: Virtually everything! Unlimited number of selfies, every places you have been to, your most embarrassing pictures, love posts for your sweetheart, fights and rants about your work, life and boss. What not to post: NOTHING. If you have carefully filtered out this category to only your well trusted friends, you have nothing to fear. Who to add: Your mom, dad, siblings, pets and other relatives. The list should also include your closest friends’ parents and your godmothers or godfathers. What to post: Family oriented materials, school/accomplishments, family trip pictures and happy posts. Your wall should look like a wall of accomplishments or if not, a wall of happiness. There is no more effective way of keeping your families’ noses from your private matters than making them assume that you are in perfect condition. Remember, no one can shame you more than your family. What not to post: S3xy/alluring pictures, Green jokes, rants about your work/school and other people. Your grandmother might have a heart attack if she viewed a picture of you wearing a clad bikini in her news feed. Nothing would be more embarrassing if your mom or dad commented, “you are grounded” after reading a cheap green joke you had posted. And if your siblings read that you are fighting an imaginary battle with your boss or another person, they would most likely overreact and come to your defense (mindlessly starting an internet war). *Facebook changes their privacy policies from time to time. Be updated about these changes and always understand the terms first before agreeing to anything! *Public posts should only be done if you are posting about global and national issues like global warming, human and animal rights and so on. Be aware if you are posting something that would be worthy of everybody knowing before you click that mouse. On the other hand, you could use a public post when you are promoting a product, website or company because it would be able to reach the maximum number of people in no time. *Never underestimate the power of a screen shot. Your posts maybe limited to the number of people you have filtered them to see but if one of those turned out to be a backstabber, he or she could take a screen shot of your post and spread it to other people. Of course, you could always deny and claim it to be an altered or Photoshopped picture but the doubt and malice would have been already established. *Again, if one of our friend turned out to be a backstabber, he/she could tag another person’s name who is not suppose to see your posts in the comment’s section causing that secret post to be revealed. *Be aware of your own country’s laws about cyber crimes or libel provisions. Practice the saying, “Think before you click” and most importantly, be ethical about using not only Facebook, but also the Internet as a whole. If it would only cause harm to others, be discouraged to post it. Social media has completely changed the world we live in. It seemed like a completely different realm from reality. However, our breeding, morals and virtue should never change. We should remain responsible and accountable of all our actions online. Think about this; we build our real houses with opaque materials and not glass walls for our privacy so we should also value our privacy online. We do not directly open up to a random stranger or anyone who we just met so we should also be cautious of what information we share on our wall. Share it to others, friends and love ones to make their privacy safe.